My first experience with Edible Edifications was a VBS luncheon where Brenda had prepared a delicious pasta dish with salad, bread, and yummy chocolate chip cookies. At that point, I knew if I ever need a caterer, I would use her. Not only was her food delicious, but I LOVE what she and her business stand for – God! It’s right there at the top of her webpage – Psalm 34:8. She lets everyone know that she is in the business of edifying God in everything she does. We were able to use Brenda for our son’s graduation party and had an overwhelming response of having the best food in the buffet of graduation parties that day! Then we were able to use her for my parent’s 50th wedding anniversary. Talk about a life-saver! She was absolutely wonderful! I knew without a doubt that I had no worries. The food was not only delicious, but the presentation was gorgeous! After that, I was able to get on her “Monday Meal” list. My family and I have enjoyed some delicious meals together at home without the stress of trying to get home from work and cooking dinner. We have been thrilled with the products we have received from Edible Edifications. The cakes were beautifully crafted and tasted delicious. Our guests commented on how attractive the cakes were at our events. Thank you so much for the wonderful job you did to make our events special and unique! We will definitely be using you for all of our event catering needs. Yep, did it again! I’ve had the pleasure of working with Brenda and Edible Edification on corporate and personal events for many years now. The most recent event was my daughter’s wedding to her long-time sweetheart. 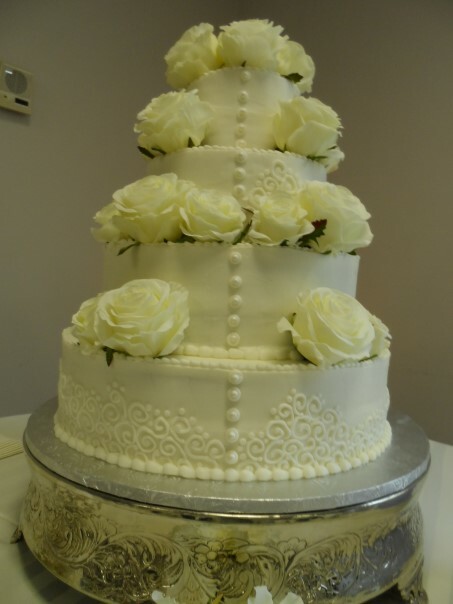 As wedding cakes often are, it was very specific in decorative detail, flavors, and the number of servings. Brenda was amazing – as always. She thoughtfully perfected this cake so it was really quite the amazing centerpiece for the reception. 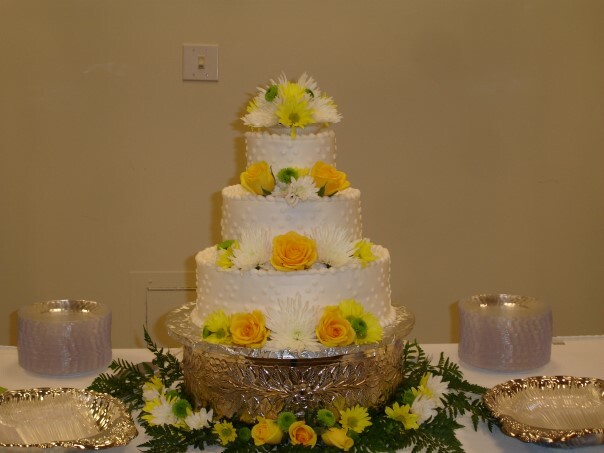 Guests of the bride and groom commented that the cake was not only beautiful, but moist and delicious. 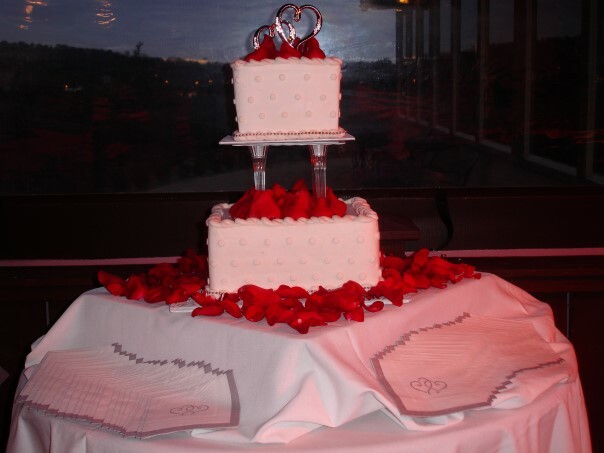 Brenda, thank you for celebrating Matt and Halleson’s special day by joyfully providing them a fantastic wedding cake! I needed someone to cater a fundraising event I was hosting during my campaign. I've know the Lads for a long time, plus I've been to many events that they have catered. It was an easy decision. Edible Edification did a fantastic job. Everything was handled professionally & affordably. The food looked & tasted delicious. I will definitely use Edible Edification again the next time I need a caterer. Brenda provided the cake and cupcakes for our wedding and did a wonderful job! Brenda did a great job of listening to my ideas and budget and creating just what I pictured! Everything turned out beautifully. More importantly, everything was delicious!! So many of my guests commented on how delicious the cake and cupcakes tasted. Brenda is a pleasure to work with - she took great care of me :) I would highly recommend Edible Edification for any event! Eight years ago, I engaged Brenda to cater my daughter’s wedding reception. The guests all raved about the food. The wedding cake and groom’s cake were beautiful and delicious. 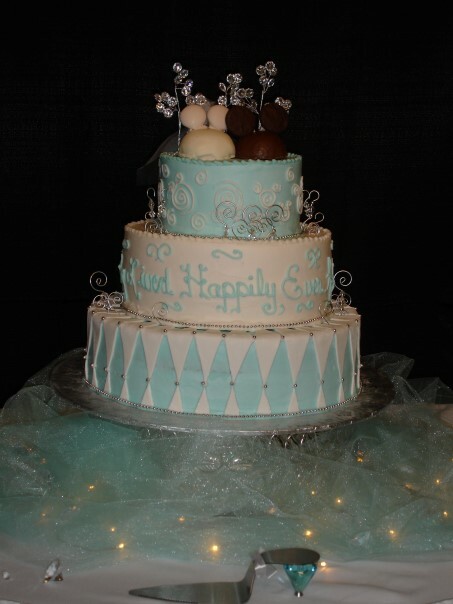 This past summer, I again engaged Brenda to provide the wedding and groom’s cakes for another daughter’s wedding. We met with Brenda before-hand to sample cake and icing and to discuss design. As expected, the cakes were amazing! They were beautiful as well as delectable. The guests asked about the cakes for months! I have had the pleasure of being at other events Brenda and her staff have catered over the years, and the food is always delicious, the staff always professional. Brenda even makes the display of the food appetizing to the eye. When anyone asks me to recommend a caterer, whether for a big event or just a cake, I always highly recommend Brenda and Edible Edification. Our church was planning a Christmas dinner and in the past, since we are a very small church, we just bought fried chicken at a nearby grocery store. So this year we decided to try to have turkey and ham and have it catered. We had never had anything catered before and not only did Brenda help us tremendously in this unknown territory, but she gave us a fabulous price and delicious food. The food was served at exactly the right time and was very convenient to be served to our small congregation. Everyone enjoyed it immensely. It was wonderful! Brenda and her staff did an incredible job serving a large number at our Sunday School class. We had about 90 present. The food they served was absolutely delicious and the presentation of it was superior. The spirit in which the staff served us was also outstanding. I assure you this will not be the last time we use Edible Edification. Brenda’s warm personality and friendly spirit make planning a celebration a joy. She recently catered our daughter’s wedding and did a fantastic job. Brenda took time with us to plan the meal (even adjusting a dessert to make the groom happy J), visited the venue beforehand to make sure she could do everything well, and kept in constant contact with us from the minute we first met with her through the wedding. Her calm presence helped tremendously throughout the entire planning and executing process. The venue (a barn) had some challenges, but Brenda was able to accommodate everything excellently and provide a wonderful “comfort food” buffet that was enjoyed by everyone. The food was not only delicious but hot and appealing to the eyes. Her staff was extremely friendly and willing to help with anything we asked them to do. I would not hesitate to use Brenda and her wonderful staff at Edible Edifications again. I highly recommend her!! Many thanks, Brenda, for all you did to make Heather and Steven’s wedding a day they will remember! I simply can't say enough good things about Brenda, her staff, and her catering service. She first amazed me when she catered for my wedding. Not only was the food incredible, but Brenda showed remarkable flexibility and diligence in working with our event space. I later hired Edible Edification to cater for a 2-day music video shoot I directed for Grammy award-winning artist Lecrae. Again, the food was incredible, her service outstanding, and the whole catering service was professional. I heartily recommend her! Edible Edification, and owner Brenda Lad, are my go-to caterer for any event I am hosting or helping plan. Over the course of the past 6 years, I have used Edible Edification not only for my own wedding, but as well as several other weddings and conferences and parties of all sizes, locations and challenges. As an event planner, having a dependable, flexible and exceptionally capable caterer is at the core of my success. It also doesn’t hurt that the food and desserts and wedding cakes are divinely delectable! You are not going to find a more willing and able, flexible, budget friendly, caterer that takes the time to work with each client to make each specific event as tailor made as possible, and all within your budget. The attention to detail along with friendly and professional service given by all staff members is above par. Edible Edification has been able to work with many challenging circumstances whether it be a location with no kitchen, last minute guest number increases, or miniscule budgets, and they have worked joyfully, exceeded my expectations each time. I would, and do, highly recommend Edible Edification to anyone planning any type of event. Thank you so much for catering our LoveLoud widow's event. I know everyone enjoyed the delicious food - I did! As soon as I got home I devoured the chocolate cake! Delicious! I appreciate your servant's heart and hope to work with you again. Blessings! We have used Brenda’s services many times and are always pleased. Our expectations for the quality of her food and service are always high, and she has met or surpassed those expectations every time. Her professionalism and courtesy are abundant, and she has always remained flexible to accommodate any special needs. The evenings are well-planned and perfectly timed. We dread the day that a schedule conflict would force us to use anyone else for our catering needs. We highly recommend Edible Edification with Brenda Lad!! We recently enlisted Brenda Lad, who came highly recommended, as the wedding caterer for our daughter, Melody's, wedding reception. From the beginning of planning, Brenda was very engaged in helping us choose just what would make Melody and Donald's wedding day very special. It was quite obvious that Brenda had many years of experience as she graciously guided us through the planning process. She was extremely organized from beginning to end which made the process easier and more exciting for us. Melody and I even tasted the food items we were interested in having at the wedding so we knew what our guests would be served. That was a special touch as Brenda so lovingly served us. We were excited about the food for the reception. Brenda even had pictures of the food to show us how the food would be displayed. 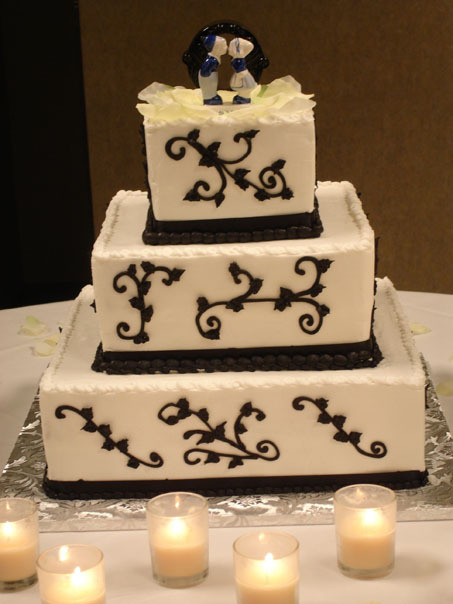 Melody had been searching for wedding cakes on-line and found one she loved. She gave Brenda a picture of the cake and Brenda did a wonderful job reproducing that particular look. Also, guests at the wedding complimented how moist the cake tasted. Brenda has a decorator's touch in displaying the food beautifully, as well. Our experience with Brenda Lad was excellent and we highly recommend her services! I had chosen Brenda from pictures I had seen and could tell she was a perfectionist with her decorating. 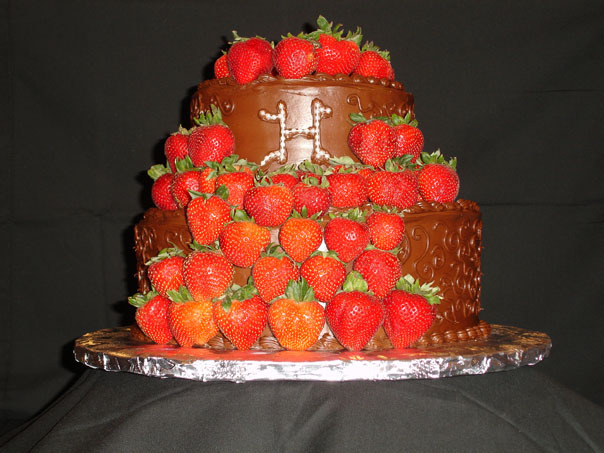 We had asked for one strawberry and one chocolate cake, and she delivered on both taste and style. We were more than pleased, and so were the guests at our party. You can count on professional service and courteous guidance from Brenda at Edible Edification. I will not hesitate to call on her again for my next event! 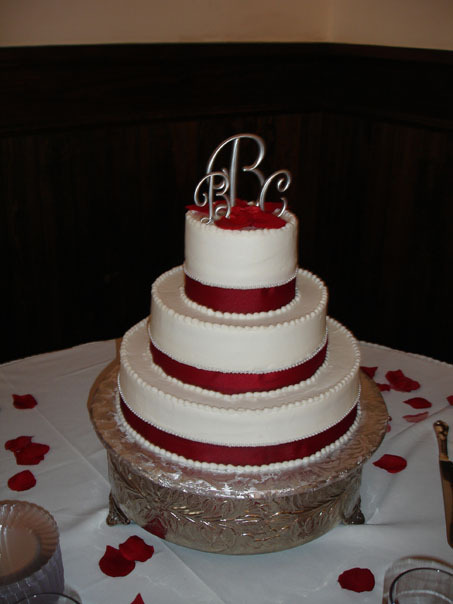 "My whole family loved the pound cake with raspberry filling so much that you made for our Wedding Cake that we decided to only use you from now on for all of our Specialty Cake needs! Many of our guests asked "Who made the cake and how do I get in touch with them?" Honestly, it was as delicious as it was beautiful and we couldn't have been more pleased!" We used Edible Edification to cater my daughter's wedding this fall. Edible Edification was a pleasure to work with. Brenda Lad and her staff were wonderful. First of all, Brenda worked with us from the very beginning of the engagement. She prepared several dishes for us to try, and then we selected our favorite. Then she made a couple of cakes for us to try. It was very hard to decide. I've tasted her cakes many times over the years, and they are always delicious. She went above and beyond to make the cake that my daughter had her heart set on. She specially designed it according to my daughter's wishes. And I must say it turned out to be the most adorable wedding cake I've ever seen. We were delighted with it!!!! We had a wonderful sit-down meal that was served by their professional staff at a very affordable price. I will use Edible Edification whenever the need arises again. Brenda Lad and her entire team at Edible Edification were key to making our special day so enjoyable and relaxed. Brenda met with us after our initial catering plans fell through at the last minute. She was amazing, professional and calm. After the initial Consultation, we knew immediately that the food and cake was no longer a concern, she had it covered. I especially appreciated her contagious smile and the way that her team was instinctive in meeting the needs of the wedding party. During the reception her team made sure that we had water to drink as we visited with our guests and she even packed a beautiful “away” basket for my daughter and son-in-law. Thank you so much Brenda for you excellence, going way above and beyond all that we imagined and mostly for your joyful spirit and servant heart. Edible Edification did a fabulous job with the reception food! You were a pleasure to work with! The presentation was gorgeous, the food tasted delicious. That day you made us feel we were the most important people on the earth. Thank you for your flexibility. We were thrilled with your gracious service - your ministry! Thank you, too, for all the things I am sure I have no idea that you handled! It was "our pleasure." You helped make Lindsay and Paul's day perfect. Finding out that the caterer set to do our son's wedding rehearsal dinner was unable to it just weeks before the wedding was very stressful. A friend at church recommended Brenda and she graciously stepped right in. We were able to keep the same menu and the food was wonderful. Chicken Parmesan and some great lasagna were enjoyed by everyone. What a blessing she was and her business gives the glory to GOD. Thank you so much for sharing your gifts from the Lord-we will be happy to recommend you to anyone who has a special event and needs wonderful food! Brenda is truly gifted in the work she does. She catered the reception for my 25th wedding anniversary and did a wonderful job. The food was delicious and the presentation was beautiful. It was so awesome to be able to relax and know that she was handling every detail so that I could enjoy my special day. I will always be grateful! I cannot say enough wonderful things about Brenda and her catering my daughter’s wedding. Choosing her for the food and cakes was the easiest decision of the whole wedding planning process. I have known Brenda for many years and was very aware of her organizational skills, her eye for detail, and her gift of hospitality. Brenda was always available and willing to answer any questions we had. Her years of experience helped with many decisions we had along the way. I was always confident that she would take care of our special day as if she were taking care of her own daughter’s special day. She presented a fun cake tasting presentation for the bride and groom. Her guidance while choosing a menu was very helpful because we were working with some restrictions at the venue. She and her friendly staff presented a beautiful, tasty spread at our reception. The fruit volcano was a breath taking work of art. I would recommend Brenda for any event. She can take care of your special event no matter the size. Thank you Brenda and Edible Edification for a wonderful stress free event!!! My daughter announced she was engaged and wanted to get married in one week! The three most important things to her was 1. Dress 2. Photographer 3. Cake. Finding the perfect cake was the easiest, because I knew just the right person.. Brenda Lad! I have known Brenda for many years and have always enjoyed her catered food! 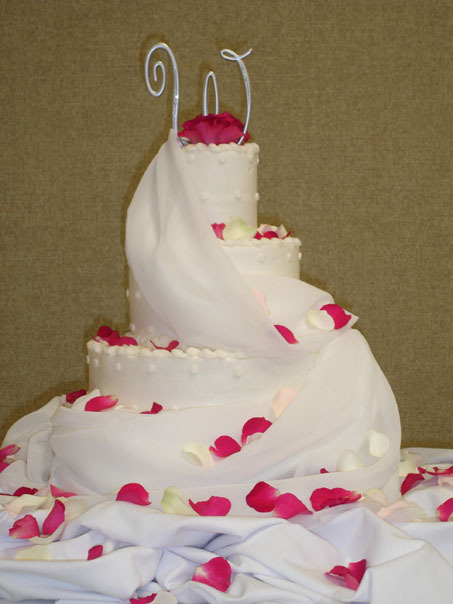 Thankfully, Brenda had availability and willingly took on baking my daughter's wedding cake at the last minute. Brenda listened to my daughter's ideas of what she wanted her cake to look like and helped her pick a cake within our price range. On the big day, Brenda presented a beautiful, delicious cake that exceeded our expectations. After the wedding, Brenda walked me through the process of preserving the top layer of the wedding cake so my daughter and her husband could enjoy it on their first wedding anniversary. She also explained to me that when she makes a cake, she prays for God to guide her hands and she prays for the person she is baking for. Brenda went beyond anything I could have asked for when making my daughters wedding cake. Her love and prayers throughout the process was truly "icing on the cake." For two years in a row Edible Edification has catered a "princess tea" held in honor of local abused, abandoned and neglected children in foster care at Royal Family Kids' Camp, Woodstock, GA. The tea hosts 25 princess girls and 60 special guests. Brenda and her team do a sensational job from beginning to end! She is a pleasure to work with as we began planning out the details of the finger sandwiches and chocolate fountain. Every tiny detail was covered to perfection! The buffet table was beautiful, the food tasted better than it looked! I highly recommend Edible Edification to anyone wanting a high quality caterer with over the top culinary capabilities! You WILL NOT be disappointed! Brenda is a joy to work with. She and I have done many luncheons together, decorating tables, preparing food, etc. for our women's Bible study. Her cooking is amazing! She is such a gifted planner/organizer - always thinking of the perfect touches to make each luncheon special. Brenda knows how to put together a great menu for any occasion. It's so much fun to partner with someone who truly loves what she does and does it with excellence. That's Brenda! Sometimes a special occasion calls for a cake decorator to go the extra mile to ensure the client gets what they want. That is just what happened when we ordered our wedding cake from Edible Edifications. We had quite specific designs we wanted to incorporate into our cake being that my fiancé was from Holland. We got the look we wanted and the cake tasted amazing! We ate our wedding top layer for an entire week on our honeymoon! Not to mention...the service, friendliness, and faith of the staff made for an all enjoyable experience...it was truly edifying! We have been extremely pleased with the cakes Brenda has made for our child's birthday partys. You can provide her with any picture or idea and she will make it happen! The best part is not only does the cake look great.... it tastes amazing as well!!! You will never be disappointed when Brenda makes your cake... she is the best!!!! Jamie brought home the top layer of our cake today. It's going to be near impossible to wait until our 1st year anniversary to eat it!!! Thank you so much for our scrumptious wedding cake. Everyone at church is still using my cake as a "measure to"! No one has come close! Thanks again! Edible Edification made our graduation party so stress free! They were friendly, courteous, and extremely professional. Everything was done top notch, and the food was delicious! I couldn't have gotten through the event without them! Thank you so much for helping make my daughter’s sixteenth birthday party such a fantastic event. The chocolate cake with cascading strawberries was as beautiful as it was delicious. I am always impressed by your attention to detail and the wonderful work you do. You know I’ll be calling again for the next big event! I would like to say the customer service and attention to detail for my wedding cake was phenomenal!!! You walked me though every step of the process and kept to your word from day one. You were recommended by a friend of mine and I'm glad I took her advice. I am hoping to use Edible Edification for future events. I would also recommend them to anyone I know looking for someone who needs a wedding cake, or any kind of catering service, etc. Brenda is FABULOUS!!!!!! "We were given Brenda's name and number by our friends whose daughter has had beautiful birthday cakes! Ozzie was having a Batman birthday party and we wanted a cake to incorporate it but not just a store bought sheet cake with plastic action figures! I described to Brenda what we wanted and she brought it to life! Not only did Ozzie's cake look perfect it tasted delicious! We can't wait for November this year, but we'll need two cakes! Owen will turn one year old two days after Ozzie turns 4!" "Brenda did a great job catering my wedding. The food and service were fantastic and I recommend her to all of my friends. She worked well with the budget I had in mind and did everything she could to capture the vision I wanted for my wedding day."